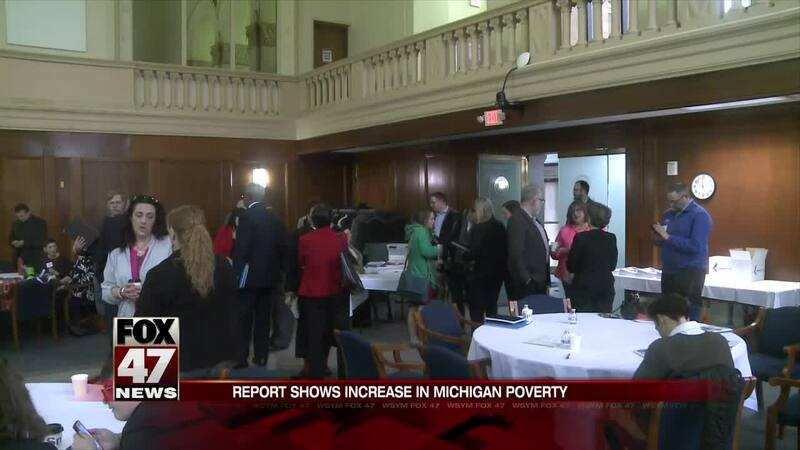 The Michigan Associated of United Ways released its ALICE Household report Wednesday. ALICE Households are those that are asset limited, income restrained, but employed. The report shows a 13% increase in ALICE Households in Michigan since 2010. LANSING, Mich. — The Michigan Associated of United Ways released its ALICE Household report Wednesday. ALICE households are those that are Asset Limited, Income Constrained, Employed. The report found that 43 percent of Michigan households fail to make ends meet, up from 41 percent in 2017. Despite overall improvement in employment and gains in median income, 1.66 million Michigan households could not afford basic needs such as housing, child care, food, transportation, health care and technology. The cost of the average Michigan family budget also increased by 27 percent from 2010 to 2017, despite a low rate of inflation nationwide—12 percent during the same timeframe. The report shows a 13% increase in ALICE Households in Michigan since 2010. United Ways CEO Mike Larson says the report aims to encourage lawmakers to come up with ways to help Michigan's most vulnerable residents. United Ways currently work to provide some short- and medium-term solutions for ALICE households, such as offering scholarships to access quality child care, free tax preparation and financial and career mentoring. In shedding light on the underlying causes keeping ALICE households from getting ahead, MAUW provides information that will inform discussions with businesses, government agencies, other nonprofits, the faith-based community and residents to create solutions for a stronger Michigan.